In ancient times, Egypt’s influence extended over Nubia, a vast geographical area that starts south of Aswan and ends at the confluence of the White Nile and the Blue Nile. Because of its strategic importance, the area of Nubia around Lake Nasser and Aswan is full of archaeological treasures and impressive monuments. 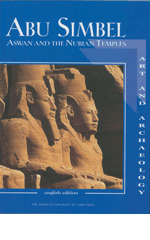 This fully illustrated book gives a concise history of the exploration of Nubia and the sites and temples of Lower Nubia, as well as explaining in depth the archaeological rescue mission that captured the world’s imagination in the 1960s: the salvage of Abu Simbel and the Nubian temples. Detailed descriptions, plans, maps, and photographs are given of all the sites involved, including the temples that were dismantled and rebuilt in new locations above the rising waters, as well as those that were donated in thanks to nations assisting in the rescue. The most up-to-date scientific research, color photographs, and maps allow the reader to make a virtual visit to the archaeological sites and absorb the history of Nubia in all its complexity.